The second cat is coming along. I’ve done additional layering, further defining the dark stripes, which help to give shape to the body. I’ve layered the orange on top of that so my next step will be to continue to fill in shade/form with some of the more muted colors to tone down the orange. Getting closer to the finish! 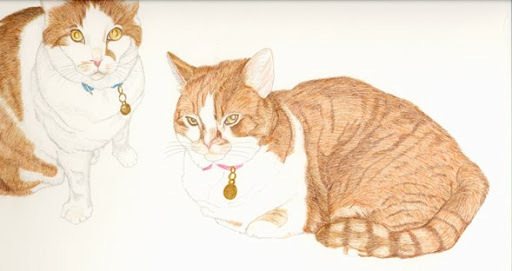 Next Two Cats in colored pencil – finished at last!